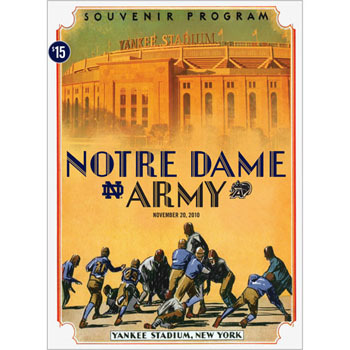 The Army-Notre Dame game this Saturday in Yankee Stadium might be the most unique college football ticket this weekend. It has all the trappings of bowl game, which is ironic considering Notre Dame needs this win to earn a bowl bid. Good luck finding a ticket for under $80, though. Notre Dame sold out of its ticket allotment Tuesday. Their tickets sold for $175 a piece. Army, the visiting team this weekend, sold its tickets months ago. A quick search on StubHub.com found two tickets at $80 a piece. Those are the cheapest I found Wednesday morning, but they could have been snatched up by the time this is posted. The cheapest tickets on Ticketmaster came to $101.90. On the other end of the spectrum, the most expensive ticket on Ticketmaster is $679.65 including fees and priciest ticket on StubHub.com will cost you $501. Why not make it an even $500? A stingy seller I guess. The ticket price is just the beginning. Throw back a few $10 beers, scarf down a $6.75 Nathan’s hot dog and batch of $8 frickles (fried pickles) and the price keeps rising. This is nothing new, though. It’s the reality of attending live sports events nowadays. And maybe why fewer people are attending.